I would like to send video over a satellite modem, but these things are as slow as 1990s era dial-up modems. HD video with the H.264 codec streams at 2 to 3 Mbps, so the amount of data must be reduced by a factor of ten or twenty for low speed satcom. Instead of running at 30 fps, one should stream at 1 or 2 fps and most off the shelf video encoder/decoder devices don't know how to do that, so I dug a Raspberry Pi v3 and a v1.2 camera out of my toy box, installed gstreamer and started tinkering on my Mac to gain some experience with the problem. Of course one can do the exact same thing on a Linux laptop PC, but what would be the fun in that? With the gstreamer videorate plugin, one can change the frame rate to almost any value and cranking it down to 1 or 2 fps is no problem. One could go down to a few frames per minute, but super slow streaming could cause a playback synchronization issue, because the player error handler may time out before it manages to synchronize. Also note that satcom systems spoof the TCP ACK packets locally, to speed things up a bit. This means that TCP and UDP work the same over a satcom link. Now you can exit nano and save the rc.local file. Add "net.ifnames=0 biosdevname=0" to the end of cmdline.txt. Add the above to /etc/rc.local to enable the /dev/video0 device at startup. Now, when you restart the Pi, it should be ready to stream video. You could edit the above on the Pi with the nano editor, or move the SD card back to your desktop computer, mount the rootfs partition and edit the file there. This a MAJOR advantage of the Pi architecture: If you mess something up and the Pi won't boot, then you can fix the SD card based system on another machine. Also, to replicate a Pi, just make a backup and copy the SD card. $ ssh -X pi@192.168.1.10 "gst-launch-1.0 videotestsrc ! autovideosink"
$ ssh -X pi@192.168.1.10 "gst-launch-1.0 v4l2src device=/dev/video0 ! video/x-raw,framerate=2/1 ! autovideosink"
The problem with setting up a streaming system is that there are many pads and each pad has many options. These options don't necessarily work together and finding a combination that does approximately what you need, can be very time consuming. However, the defaults usually work. So the best approach is to make a basic stream, get it to work and only then start to experiment, while keeping careful notes of what works and what doesn't. A simple raw stream give me ‘message too long’ errors. The solution is the ‘chopmydata’ plugin. If you enable the WiFi access point feature with raspi-config, then the Pi can make a fairly decent home security, or toy drone camera, which only needs a power cable. With multicast streaming, you can connect from multiple computers on the LAN simultaneously. If tcpdump shows that the Pi is streaming, then start a player on another machine. The VLC player should also work, but stupid players like MS Media Player or Apple Quicktime, will not be able to figure out what to do with a simple raw UDP stream. These players need RTP to tell them what to do. When you slow things down a lot, then every frame is different. 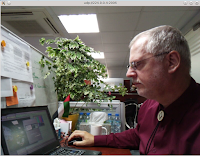 Consequently the H.264 codec will not work well, so I rather selected the Motion JPEG jpegenc codec. There is a statically compiled version of FFMPEG for Windows. Search online for "zeranoe ffmpeg" to find it. Note: If you make the frame rate very slow, then it will take ffplay a very long to synchronize, but it should eventually pop up and play.
! x264enc bitrate=512 speed-preset=superfast tune=zerolatency ! However, the moment I add the mpegtsmux, it is too much for the Pi to handle. One would need to hook up a second Pi to convert the raw stream to an encapsulated MPEG-2 TS stream, or use a faster computer. I found that the processor load is about 30% with MJPEG, so a little Pi is perfectly fine for streaming video from a single camera, if one uses a simple codec. The x264 codec is a hungry beast and consumes 360% CPU according to top, which means all 4 cores are running balls to the wall, indicating that this codec is not really suitable for a little Pi v3 processor. Nevertheless, it shows that one doesn't have to do H.264 encoding in a FPGA. It can be done on a small embedded processor. Note that multicast routing is completely different from unicast routing. A multicast packet has no source and destination address. Instead, it has a group address and something concocted from the host MAC. 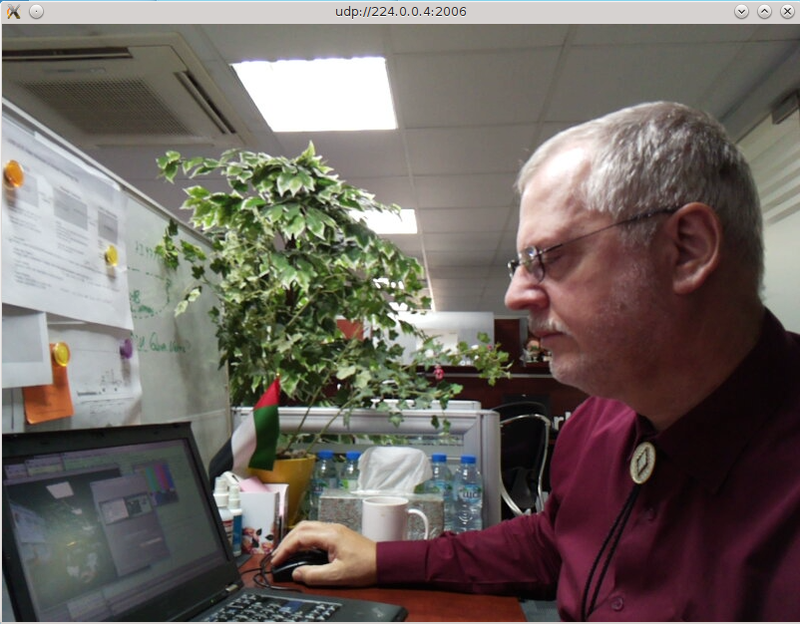 To receive a stream, a host has to subscribe to the group with IGMP. If you need to route video between two subnets, then you should consider sparing yourself the head-ache and rather use unicast streaming. Otherwise, you would need an expensive switch from Cisco, or HPE, or OpenBSD with dvmrpd. Linux multicast routing is not recommended, for three reasons: No documentation and unsupported, buggy router code. Windows cannot route it at all and FreeBSD needs to be recompiled for multicast routing. Only OpenBSD supports multicast routing out of the box. and taste good with ketchup. Also consider that UDP multicast packets have a Time To Live of 1, meaning that they will be dropped at the first router. Therefore a multicast router also has to increment the TTL. If you need to use OpenBSD, do get a copy of Absolute OpenBSD - UNIX for the Practically Paranoid, by M.W. Lucas. Note that if you don't put a framerate pad in a simple stream, then the presentation time stamps in the stream are wrong/missing, causing the video to play back in slow motion, which can be very befuddling to the uninitiated. Sometimes, ffplay is not part of the FFMPEG installation. If you have this problem and don't want to compile it from source, then you can use ffmpeg with SDL as below, which is what ffplay does also. 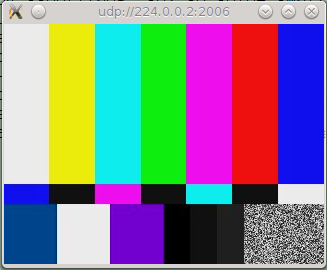 Of course you can use gstreamer to play it, but I prefer using a different tool for playback as a kind of error check. I also could not get the WiFi device to work as an access point with hostapd. Some more head scratching is required.